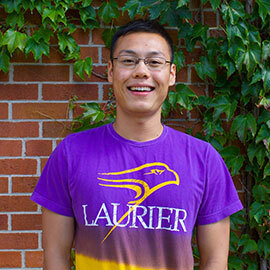 In September of 2015, in the beginning of his third year at Laurier, Zack (Guanglong) Pang “took a chance” and applied to the Writing Centre to be a Student Assistant as part of the International Student Work Exchange Program. “That’s when my love of writing began,” he said. Zack didn’t always love writing. In fact, in his first couple years at Laurier he would intentionally avoid writing courses. English was, after all, his second language. But when Zack transferred from Business to the Faculty of Arts at the beginning of his second year, he could no longer avoid writing courses. Instead, he began to embrace writing. A large component of Zack’s role as a Student Assistant included writing posts for the Writing Centre blog. Always eager to learn and improve, Zack came to appreciate that developing a good piece of writing takes time. Like any published material, his blog posts often went through numerous revisions before being posted. Through the process, Zack’s writing skills developed considerably. In fact, he impressed his supervisors at the Writing Centre to such an extent that they recommended he apply to become a Writing Tutor in his fourth year. Through his hard work and determination, Zack became the Writing Centre’s first international student Writing Tutor. This accomplishment did not quell his fears, however. Zack isn’t content with being comfortable, however. During his time at Laurier, he has continually pushed himself out of his comfort zone. Only a few years ago, Zack left his family in China to come to Canada and study at Laurier. He could have easily lived with fellow international students from China. Instead, Zack decided to live with domestic students to force himself to speak English. All the while, his speaking, writing, and confidence improved. By his fourth year, Zack had integrated himself so deeply within campus life at Laurier that he had three on-campus jobs. Meanwhile, Zack was excelling academically. In his third year, he enrolled in a Geography thesis preparation course, which involved a substantial amount of writing, including a literature review and thesis proposal. In his fourth year, he continued this work in the Geography thesis course. Zack’s thesis project focused on the experience of international students, particularly the challenges they experience integrating into campus life. These are challenges that Zack has been able to overcome, in part because of his courage and perseverance. As a result of all of his hard work, Zack received a number of attractive offers from universities across Canada to pursue a Master’s degree. In the Fall of 2017, he will begin the Master’s Program in Geography at York University.